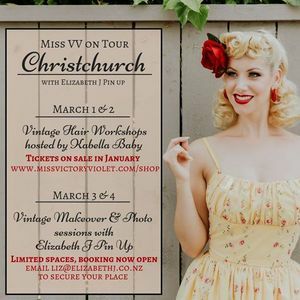 I'm returning to Christchurch after having WAY TOO MUCH fun in 2017! Thanks to the amazing Kaye at Kabella Baby - Rockabilly & Vintage Inspired Clothing and Accessories, I will be back with 2 more hands-on workshops on the evening of Friday March 1st and afternoon of Saturday March 2nd. They are completely hands-on, meaning that YOU get to do your own hair. With everyone having different hair, this is the best way to learn a new style as you can practice it on your own hair and I will be able to give you tips and advice on how to best tailor the style to your hairtype and cut. I'll be demonstrating each step on a model and then inviting you to complete the step on yourself. They are limited to just 10 participants so that I can make sure I have time to help each and every one of you. 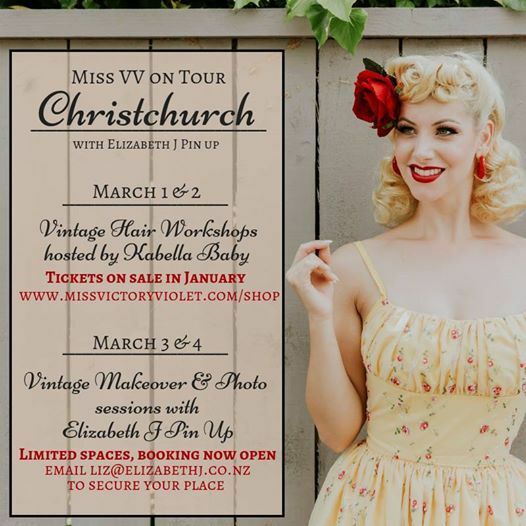 I'll also be doing two days of makeovers for shoots with Elizabeth J Pin Up Photography but they are already SOLD OUT. Perfect for a beginner or someone wanting to improve their skills, this workshop focuses on setting with a hot tong and brushing out your hair into classic 50s curls. After a demonstration on my model, I’ll be firstly helping to guide you through setting your hair with hot tongs. This tool can be tricky to master, but it is one of the most effective ways to create voluminous curls and get waves though the hair - not just curling ends. The skills you learn in this workshop can also be applied to all other setting methods. Once you have set your hair in pincurls, we will then do the brush out, creating that Marilyn Monroe front swoop. This is something that many ladies struggle with as each head of hair is so different – the great thing about attending this class is that I will be there to give you tips on your specific hairtype and haircut. Please note that this workshop is best on medium(above the bra)- short length hair. If you have waist length hair, you are still welcome to come but it’s going to be a lot harder for you to achieve the desired look. If you aren’t sure about your hair length then please email me with photos so I can advise you. I will be providing some products and equipment but you will be required to bring some of your own tools such as a curling tong and brushes. A full list is provided in the downloadable information sheet upon purchase. Ideal for vintage hair enthusiasts of all skill levels who wish to learn how to create a variety of updo’s and who’s already comfortable and competent with setting their own hair. In this workshop, you’ll be learning four different vintage styles. I’ll begin each style by demonstrating it on a model before inviting you to give it a go on yourself. We will start by creating the Poodle hairstyle that was made iconic by Lucille Ball in the 1950s. This style is fabulous for hair that doesn’t hold curl well and often you can sleep on it and wear it for several days in a row! Next, we will do a 1940s Gibson Roll at the back. This is such a timeless look and can be combined with a variety of styles at the front. After the Gibson Roll, we’ll give Victory Rolls a try! These are actually quite simple but they can be difficult to get the hang of. I’ve got a few tricks up my sleeve to make them just that little bit easier and I’ll be able to help you create that perfect roll. Finally, we will move onto Bumper Bangs which is a quick and easy technique that gives that Bettie Page vibe but without having to cut your fringe! Do them smaller for a more authentic feel or big and bold for a Rockabilly look. Please note that for this workshop, you are required to come with your hair already set in your preferred method so it is best to have some experience and practice at setting your hair. This workshop can be taken by ladies with hair below the shoulder and above the bra. If you aren’t sure about your hair length then please email me with photos so I can advise you. I will be providing some products and equipment but you will be required to bring some of your own tools such as brushes and combs. A full list is provided in the downloadable information sheet upon purchase.